Vanke Jierong Tower is distinguished through its zig-zag patterned façade, with its alternating opaque and transparent vertical stripes. It was achieved by a design-oriented façade engineering process that can be summarized into two main ideas: First, it introduces a very low glass-to-wall ratio compared to the surrounding towers; and second, it employs specifically designed details that register at both close range and from a distance. The zig-zagged façade is fully glazed facing the southwest and northeast direction, and is fully opaque with stone cladding in the southeast and northwest directions. This façade composition is intended provide the best views, out to a public park, balanced with the requirement for a reasonable daylight condition for the office spaces. The opaque edges also shield occupants from the noise of a nearby highway. To give a unique and contemporary character to the zig-zag facades, its inner corners have a curved design. This allows subtle integration of operable windows behind a perforated aluminum sheet, and indirect façade lighting, without interrupting the design of the vertical stripes. The view out from zig-zag façade allows occupants to see both the inner and outer side of the façades. 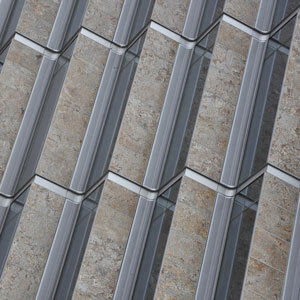 The façade details are therefore designed to achieve the minimum joint gaps and sharp edges at all intersections.